Many of our partners have asked for this flexibility so we're happy to announce our latest feature: default line listing view control for every list page on your site. Some of you like the Simple view, some like the Art view, and others like the Detailed/block view for tracks, albums, labels, catalogs, artists and composer list pages. Now the control is 100% in your hands. To set the default view for each of your list pages just go to the General tab in your Admin Panel and scroll down to the new "List Default Views" section. Each list page on your site will be represented in this section, and to set the default view simply grab the drop down and select your view of choice. It's that easy. 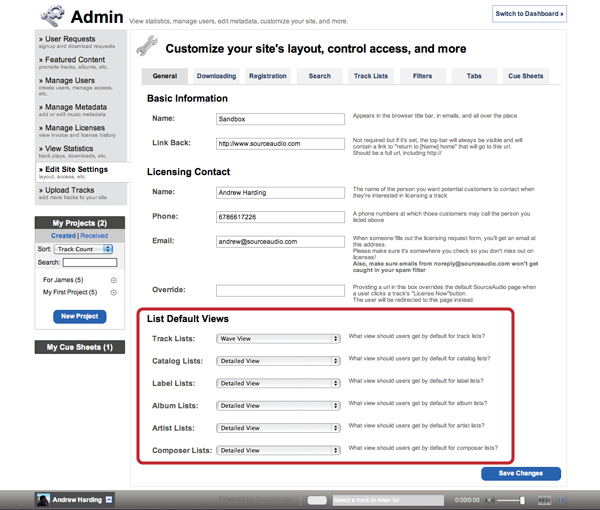 Remember one thing - users have the ability to control their own default view for various pages on the site and if they do so, that setting will maintain priority over the site-level defaults. It's all yours. Go ahead and set your new page view defaults!